The owners of a private residence wanted to get started with construction on a remodeling project at their home. However, they ran into a problem when they were told that their main electric feed ran to the back of their house, which is where the addition would be built. They had been told it may run under the garage, or around the perimeter of their house. In order to locate the exact location they decided to give GPRS, LLC. a call. Ground Penetrating Radar Systems, LLC. specializes in locating private utility lines, and completes hundreds of these jobs every day across the country. 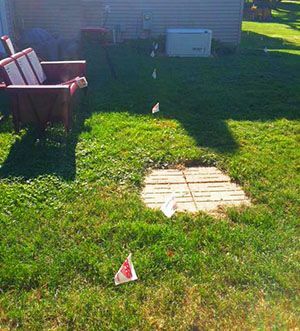 The homeowners were pleased when they called the technician that covered the Upstate area that he was available to complete the project the very next day. Jim Bell of the Upstate, New York office mobilized to the site and began marking out all of the utilities that were located in the area the digging would take place. In addition to finding underground utilities, and storage tanks, Ground Penetrating Radar Systems has the ability to locate and map out rebar, post-tension, and conduit prior to saw cutting and trenching, and in some cases unmarked graves. If you are interested in obtaining more information or a quote please contact your local representative, Jim Bell, at (315)715-5137 or jim.bell@gprsinc.com.